The best managed service providers remotely address nearly 99 percent of customers' IT issues. But for that final one percent of problems -- the headaches that require on-site support or face-to-face hand holding -- I hope MSPs and hardware-as-a-service (HaaS) pros begin to emulate Apple's Genius Bar concept. Here's why. The best managed service providers remotely address nearly 99 percent of customers’ IT issues. But for that final one percent of problems — the headaches that require on-site support or face-to-face hand holding — I hope MSPs and hardware-as-a-service (HaaS) pros begin to emulate Apple’s Genius Bar concept. Here’s why. Earlier today I experienced a problem that required on-site support. My MacBook Pro keyboard, after nearly three years of intense pounding (translation: daily blogging), was beginning to fall apart. So I scheduled a visit to my local Apple Retail Store’s Genius Bar. The customer experience was amazing. I’m not suggesting that MSPs and HaaS providers can afford to run out and hire/train a bunch of college kids who can sit around speaking with customers all day. But I do believe MSPs can learn quite a lot from the Genius Bar customer experience. 1. The Appointment: Instead of placing endless calls and sending endless emails for support, I merely went to the Apple Store’s Online Concierge. Next, I was able to choose a day and time to sit down with an Apple Genius Bar expert. I also briefly described my support issue during this scheduling effort. I think the entire schedule process took less than 10 minutes. Web experience: Amazing. 2. The Visit: I arrived at the Apple Store, as scheduled, and headed over to the Genius Bar. Apple’s in-store expert already knew about my specific issue. Unlike a doctor visit or so many other “service” visits we experience, I didn’t have to re-supply a bunch of user information. First impression: Amazing. 3. The Solution: The Genius Bar representative checked my MacBook Pro’s serial number and discovered the system was still under warranty. The Apple Store had replacement parts in-stock, and I expect the system to be completely repaired — at no charge –later today. Second impression: Amazing. Of course, I will quickly shift from a “thrilled” Apple customer to an “irate” Apple customer if I don’t get my completely repaired MacBook Pro back later today. But so far, Apple has lived up to its reputation for customer service. Now, what can MSPs learn from all this? 1. The Ultimate PC Support: Hewlett-Packard, Lenovo, Dell and other PC makers cannot match the Apple Store’s local support model. But MSPs sure can. I am not suggesting that you build a break-fix business. But personalized service is a great way to generate positive word of mouth about your broader solution set. 2. Web Automation: Skip those generic “contact us” forms that customers find so annoying. If a customer has an urgent problem, generic “help me” forms don’t inspire confidence. Instead, ensure all of your business contact information — including specific employee names and direct phone lines — are on your web site. Next, think about tying your Web site to CRM (customer relationship management) and scheduling software — so that customers can schedule visits with you. Assuming your offices are professional and you’ve got ample space to truly consult with your customers, you should pull them into your office space regularly. 3. Hardware as a Service: If you’re already offering HaaS, think about developing your own Genius Bar. It can live on the web — allowing customers to visit your site and connect with your pros instantly. It can live in your offices — allowing customers to schedule appointments. And it can live on the road, allowing customers to request specific on-site visit days/times. For more “customer service” ideas you can lift from the Apple Store format, check out this blog entry from our sister site, TheVARguy.com. Exactly! You hit the nail on the head with #3. It’s not about the hardware anymore. It’s about SERVICE!!!!! Clients want an experience, not just customers service. And the two are vastly different. Apple creates Loyal customers which are far better than just satisfied customers. 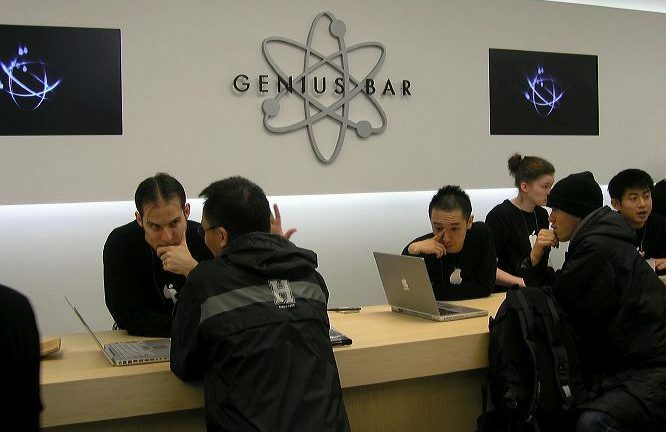 I’m not saying they don’t have their flaws but the Genius Bar is an example of a way MSP’s could profit and offer an extrodinary experience that is differentiated from their competitors. 1. Conventional Wisdom: Apple could have spent time in Best Buy, Circuit City and all the other big box retailers to learn about the PC retail sector. 2. Disruptive Approach: Instead, Apple consulted with customer service folks who are involved in the Ritz Carlton upscale hotels. I was amazed about a year ago when Microsoft announced plans to do some customer training efforts in partnership with CompUSA … the retail chain that soon-after fell off a cliff. While Apple was hanging out with the smartest people in customer service and total customer experience, Microsoft was hanging out with the worst. Yes. And this is an example of how Apple asks the question “What do the Customers Want?” and then “how can we deliver” Instead of “What do the customers need.” They also realize (as the Ritz realizes) that it’s not about the technology, but it’s about the people using the technology. As in the the case of the Ritz, they aren’t in the Hotel business, they are in the customer experience business and they deliver on that. Apple’s Genius Bar is about the service and experience more so than anything else. Just got a call from the Apple Store. My “free” hardware repair — involving a keyboard replacement for my 2.5-year-old MacBook Pro — has been completed. Thank you for the service, Apple. This post inspired me to bring my Macbook to the Genius Bar for a tune-up. Within 40 minutes of dropping my laptop off with Ben, he called my cell and told me to come pick it up. My $0 investment got me a new housing, top case and keyboard. I love Mac.